JAC Delhi Final Admission List after Spot Seat Allotment Result 2018: Joint Admission Counselling Committee Delhi has to be released the JAC Delhi Sixth Round seat allotment list on 31st July. Candidates who are seeking to get admission in Delhi in various undergraduate degree courses in institutes IGDTUW, IIIT-D, DTU, and NSIT can check the JAC Delhi 6th round seat allotment from today. 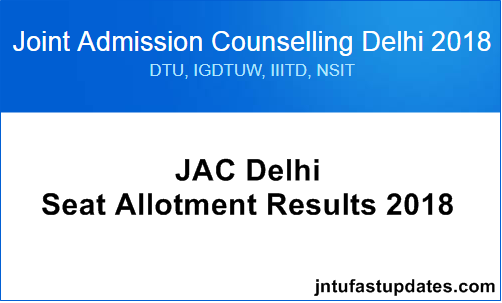 The JACC will release the Joint Admission Counselling (JAC) sixth round seat allotment results on its official portal, jacdelhi.nic.in. candidates seeking Engineering admission in JACC affiliated colleges will get admission based on the JEE Main 2018 All India Rank (AIR). Aspirants can go through the article to check the clear information about JAC Delhi 6th round seat allotment process, admission dates, and other information from the following article. Joint Admission Counselling Committee Delhi annually offers admission for students into various Engineering and other graduate degree courses. The organization will conduct the Joint Admission counseling for the JEE Main AIR qualified aspirants. Based on the rank of aspirants, the admission will be offered to the candidates. The organization conducts various rounds of seat allotment process to offer admission for the students. 5th round seat allotment process was already completed and few of the qualified aspirants got admission in institutions like IGDTUW, IIIT-D, DTU, and NSIT. Now, the JACC is moving forward with the 6th round seat allotment process. The JAC Delhi 6th round seat allotment result 2018 is slated are released on 20th July. Hence candidates trying to get admission can stay checking the JAC official website, jacdelhi.nic.in. Candidates applied for the 6th round seat allotment process can check whether they got admission or not. If they do not get the admission, wait for the next rounds of the admission process. If a candidate has confirmed the seat in any of the JAC Delhi affiliated colleges, they can lock the choice or either alter the option as per their preference. Candidates can check the detailed schedule of JAC Delhi UG admission 2018-19 from the following article. On the confirmation of admission, candidates required to pay the admission fee. The fee structure, fee payment methods, and other information are listed below.